Grand prize winners at this year’s Alaska Airlines Environmental Innovation Challenge. The grand prize winners at the Alaska Airlines Environmental Innovation Challenge proved to judges that gardening and innovation go together naturally. BioPots took home the $15,000 Wells Fargo prize with their biodegradable planter pots made from biomass waste like spent beer grains. 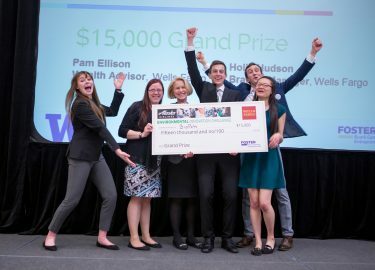 A team including students from the Bioresource Science and Engineering program captured the top prize ahead of 22 other teams from universities in Washington and Oregon.